If you frequently visit the eBay Philippines site, you may have chanced upon seeing banners of deals from Kuponan. eBay Kuponan is the latest group buying site to hit the Internet and I'm already going ga-ga over their deals. Travel bugs like me would definitely understand me. 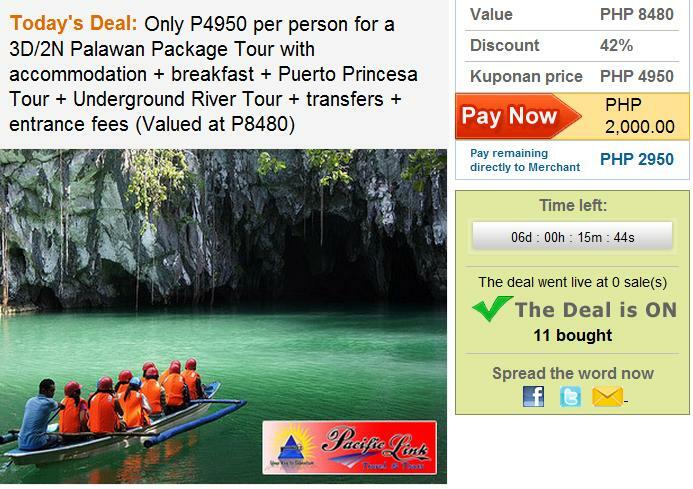 Just take for example, the 3D/2N Palawan Package Tour from Pacific Link Travel and Tours. Instead of paying Php 8480 per head, the package is now at Php 4950 per head which is means saving 42% of the actual package price. Already included in the tour package is the hotel accommodation, breakfast meals, Puerto Princesa Tour, Underground River Tour with buffet lunch, transfers, and entrance fees. Register for an eBay.ph account or sign in to your existing eBay.ph account. Your Kuponan transactions will be reflected in your My eBay Purchase History. Go to the deal's page by clicking HERE. Read the fine print and click the Pay Now button. Once redirected to the next page, indicate the number of coupons you are going to buy. Confirm your preferred payment option in the next page. You can pay via PayPal (recommended for credit card holders with PayPal accounts and those with PayPal funds) or deposit your payment through BDO or Globe GCash. You will then receive a confirmation email from Kuponan regarding your purchase. You will also receive the BDO and GCash account details should you prefer depositing your payment. You will be receiving your coupon/s a week after confirmation of payment. Now, here's the part I like the most. Kuponan will only charge a portion of the package price to the buyer. In this case, you will only be charged Php 2000 for the purchase and the remaining Php 2,950 will be paid directly to the merchant which means you'll have more time to save up for the trip! Don't forget to visit www.kuponan.ph before the deal ends! same comment with catzz_28. Please confirm if it is safe to pay pacific link travel with the whole amount? mejo malaki ksi pa babayaran ko ksi madami kmi nagavail e nakakatakot baka scam. Thanks! Hi, Jo! I'm sorry, I didn't purchase this deal so I can't say if Pacific Link Travel is a trusted merchant. Nag-full payment na po ako sa pacific link thru BDO. Nagresearch muna ako about pacific link, according sa ebay, pacific link travel and tours daw ang most trusted merchant nila, so nagproceed na ko sa payment. I'll update you once I received my e-ticket from them. That's good to know. Will look forward to your update. Hi catz, any updates on your e-tickets? Thanks. hi there any update on Pacific Link? thanks! HI catzz!oky nba etickets mo?nko ang daming nagrereklamo sa PACIFICLINK TRAVEL AND TOUR.tom reservation nila sa bora pero hanggang ngaun wala pa din etickets nila.email mo nman ako kung oky na ung etickets mo grace_isabel@yahoo.com thanks! hi!tanong ko lng kung cno ng nakakuha ng etickets nila sa PACIFICLINK TRAVEL AND TOUR.dami kasing negative kong naririnig tungkol sa kanila.may nagavail ng BORA package tom na alis pero hanggang ngaun wala pa din etickets.daming nagrereklamo. tanong ko lng po kung cno ng nakakuha ng etickets nila sa PACIFICLINK TRAVEL AND TOUR?